The next webinar, entitled SmartICE Sea Ice Monitoring & Information – Adapting to Climate Change, is scheduled for Tuesday, March 12, 2019 from 2:00pm to 3:00pm EST. The webinar will focus on SmartICE, an award-winning technological innovation for the North, which was first developed in Newfoundland and Labrador through collaboration with northern communities, including Nain and Pond Inlet. SmartICE is the world’s first climate change adaptation tool to integrate Inuit traditional knowledge of sea ice with advanced data acquisition and remote monitoring technology to provide data-driven insights into sea-ice thickness and local ice conditions in real-time, to support safer travel on ice. The 2nd SYMPOSIUM ON CLIMATE CHANGE ADAPTATION IN AFRICA is being organized by the University of Nairobi (Kenya), Manchester Metropolitan University (UK), the Research and Transfer Centre “Sustainable Development and Climate Change Management” of the Hamburg University of Applied Sciences (Germany) and the International Climate Change Information and Research Programme (ICCIRP). CleanBC will be hosting a series of Telephone Town Halls throughout March. They are looking to speak directly with up to 400,000 British Columbians on how the plan can work for them to make life more affordable and comfortable while cutting carbon pollution. There are four Telephone Town Halls, each focusing on a specific region of the province. All times listed are Pacific Time. · Wednesday, March 6 at 7 pm for the Lower Mainland and Southwestern BC. · Wednesday, March 13 at 7 pm for the Kootenays, the Interior and Northern BC. · Monday, March 25 at 7 pm for Vancouver Island and communities throughout the coast. · Wednesday, March 27 at 7 pm for the Lower Mainland and Southwestern BC. A fresh approach to “climate change migration” requires including the voices of those whose lives and homes are in the greatest danger. Global migration planning and policies must start with community-based, participatory research that can better prepare communities for both sudden and slow onset natural disasters associated with a changing climate. Carol Farbotko, a Human Geographer from the Commonwealth Scientific and Industrial Research Organization (CISRO) provides seven steps towards reframing “climate change migration,” with human security as its starting point. To read the entire article published by the World Economic Forum see here. For graduate students in British Columbia, Washington State, or Oregon, the Bullitt Foundation is now accepting applications for the 2019 Bullitt Environmental Fellowship. The Foundation awards this two-year, $100,000 Fellowship annually to one graduate student who has overcome adversity, demonstrates strong leadership potential, and is focused on work to safeguard the natural environment by promoting responsible human activities and sustainable communities in the Emerald Corridor, stretching from Vancouver, BC to Portland, OR. Eligible candidates will have a strong academic record and be nominated by a university faculty member. Students of colour are highly encouraged to apply. 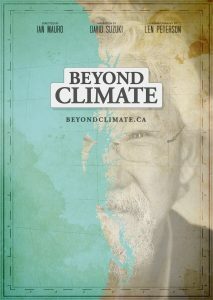 Join David Suzuki and the Pacific Institute for Climate Solutions (PICS) for a special screening and discussion of Ian Mauro’s latest film, Beyond Climate, during the University of Victoria Ideafest. Beyond Climate invites viewers to explore the climate impacts facing the places and people of British Columbia. After the screening, engage with panelists Suzuki, Mauro, PICS executive director Sybil Seitzinger, Heiltsuk First Nation hereditary chief Frank Brown and special guests as they examine different ways of advancing climate solutions. For more information and to buy tickets see here. 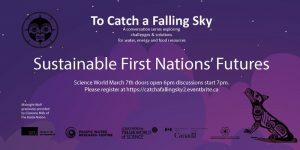 To Catch and Falling Sky is a series of public dialogues, hosted by SFU Faculty of Environment, Pacific Water Research Centre, and Science World British Columbia. 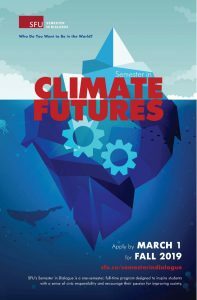 The second talk of the series, March 7th (6pm-9pm), will focus on sustainable First Nations futures. The discussion will be moderated by Emilee Gilpin (Metis and National Observer journalist), and Dr. Cliff Atleo (a Tsimshian and Nuu-chah-nulth scholar at SFU) will share ideas on governance followed by dialogue with Judith Sayers (President of the Nuu-chah-nulth Tribal Council). On March 13th, join ICLEI Canada, Renewable Cities, and the Federation of Canadian Municipalities for a free workshop focusing on communicating, implementing and measuring climate action. This workshop is intended for municipal staff, elected officials, public servants, academics, utilities, and NGOs. Join ICLEI Canada and SFU’s Renewable Cities as we present a workshop to help participants overcome common hurdles to climate conversations and gain useful skills for effective communication. This is an interactive workshop that will include technical breakout sessions focused on providing tools that you can take back to your organizations and audiences. You’ll learn foundational skills about communications and have a chance to apply them using real-world climate solutions. Learn how to strategically identify key audiences, tailor messages, and develop communication strategies using a variety of channels. Join a FCM-ICLEI Partners for Climate Protection (PCP) workshop where you will receive training and guidance on monitoring and evaluating your climate action, such as how to calculate and report on greenhouse gas reductions at the project level. Take part in interactive activities and gain valuable skills that you can apply in your own communities and organizations. Where: SFU Morris J. Wosk Centre for Dialogue, room 320 Vancouver, BC. 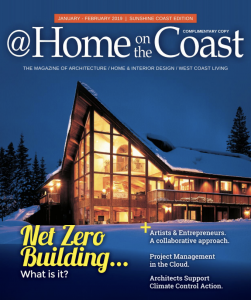 We would like to thank @Home on the Coast for showcasing in their January-February edition the joint statement signed in 2018 by the Canadian Institute of Planners, Royal Architectural Institute of Canada, Canadian Water and Wastewater Association, Canadian Society of Landscape Architects, and ICLEI Canada pledging to actively promote integrated climate action or “low carbon resilience” (LCR) within their membership. The LCR lens is meant to guide decision-making and best practices, save time and resources, increase returns on investment, and generate economic, environmental, social, and health co-benefits. Ensuring both adaptation and mitigation are coordinated and cross-evaluated can help to avoid risks and unintended consequences associated with advancing them separately. 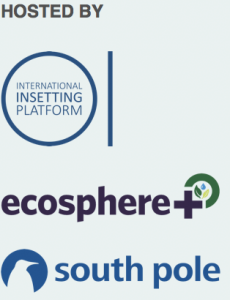 By signing the joint statement these professional associations acknowledge their role in advancing climate action in an efficient and effective way. To read the full joint statement see here. Join the Prairies Regional Adaptation Collaborative (PRAC) for an online and in-person discussion on how climate change is impacting the mental health and well-being of communities on the Canadian Prairies. The forum will contain a mix of expert presentations on the topic and community case studies from both Indigenous communities and municipalities on the Prairies. In-person participants will also be able to join an interactive discussion about issues and initiatives specific to their provinces following on the online portion of the webinar. These sessions will be launched by presentations by experts from each province. Please RSVP to Cameron Hunter (chunter@iisd.ca) to register for the in-person discussion and receive location information. 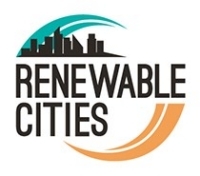 The State-City Collaboration on Clean Energy Transformations Conference (May 29-30) will advance knowledge on how national and subnational governments can collaborate with cities to accelerate clean energy market transformations. An update on the development of Canada’s Changing Climate Report, a contribution to the National Assessment – Canada in a Changing Climate: Advancing our Knowledge for Action. This report assesses how Canada’s climate has changed, why and what changes are projected for the future, and will help inform mitigation and adaptation decision-making, and increase public awareness and understanding of Canada’s changing climate. Hear from Christiana Figueres (former Executive Secretary of the UNFCC 2010-2016) and brands such as L’Oréal, Nespresso, Kering and Chanel on how they their ambition to take action and create net positive impacts along their value chains through nature-based solutions. Recent studies show that nature-based approaches to carbon capture including climate smart agriculture, restoration and conservation can provide more than a third of the emissions reductions needed to keep global temperature rise below 1.5C degrees. Whereas the uptake of these solutions has been limited so far, progressive businesses have understood the vast potential of investing into nature to help succeed in their corporate climate goals whilst building sustainable and resilient value chains. In this free half-day conference, we will share practical insights and results of innovative approaches such as carbon insetting and their role to achieving science-based targets. We will discuss practical pathways for companies to act on biodiversity and ecosystem conservation to scale positive impact towards the Sustainable Development Goals. To register contact : sandra.brandt@insettingplatform.com and events@southpole.com. Fleming College, Seneca College, Toronto Hydro and Intact Financial Corporation are launching a course to highlight the importance of flood resiliency for Canadian homeowners. The course highlights a range of solutions that can be deployed practically and cost-effectively at the lot level to help residential homeowners reduce flood risk. The course enables learners to gain knowledge and skills to help reduce the risk of basement flooding and associated damages by understanding the overarching factors that influence flood risk in Canada. Furthermore, students will gain valuable information and strategies on how to perform flood assessments on homes and how to mitigate against various risks using both mitigative actions and best practices. The course is ideal for home inspectors, emergency managers, flood-risk communicators, insurance brokers, insurance adjusters, emergency managers, landscape professionals, renovation professionals, home construction professionals and real estate agents. The course will be RIBO accredited as an added incentive for brokers.